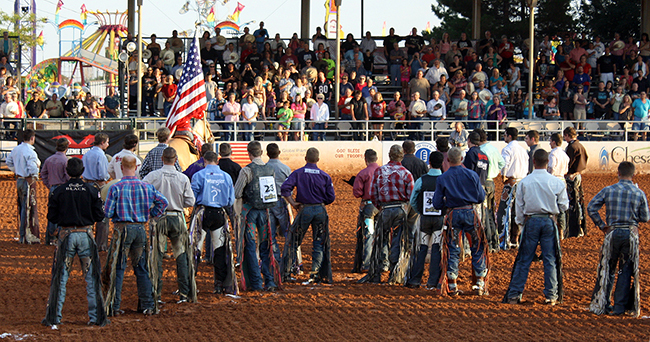 Bull riders line up during the introductions at a recent Lea County Xtreme Bulls. LOVINGTON, N.M. – Bull riding only events have been part of the landscape for decades, a way to showcase the most extreme discipline in rodeo. That concept will celebrate its fifth year as part of the Lea County Fair and Rodeos with Lea County Xtreme Bulls, set for 7:30 p.m. Tuesday, Aug. 9, at Jake McClure Arena in Lovington. It will be the perfect place for the greatest bull riders in the Professional Rodeo Cowboys Association, all battling for their share of the big money available in this southeastern New Mexico community. “Singling out bull riding and making it a certain event has been good, because people love it,” said Kenyon Burns, chairman of the Lea County Fair Board’s rodeo committee. “Bull riding is exciting, and that’s why it’s always the last event in rodeo. They get it with Xtreme Bulls. The Lovington stop is part of the tour’s premier series, which offers the largest purses in the game. That means the top 30 bull riders in the world standings are expected to be part of the field. “Sometimes that’s all people talk about,” said Corey Helton, the fair board’s chairman. “There are some people that want to see just the Xtreme Bulls. That’s a big deal. It’s televised, and we have a chance to showcase Lea County for the world to see. The bull riders couldn’t imagine their tour without Lovington in the mix. The Sulphur, Okla., cowboy rode two bulls to earn the 2015 title, pocketing more than $10,100 in the process. That helped propel Eldred to his second straight Wrangler National Finals Rodeo qualification. It was also his first victory in the Xtreme Bulls Division I, the premier division. From great community support in Lea County to a wide fan base, Xtreme Bulls has found a home in Lovington.